Today we took the babies to the pediatrician for the first time. It had been a full 48 hours since they'd been in the hospital so there was really not telling what sort of things could have gone wrong. Aside from being a big break in their normal routine it was pretty much without incident. That is until the doctor gave them their very first shots. Here they are, legs out and ready to receive them. This was probably not among the top five things that has happened to them in their very short life. They cried for about a minute after the shot. Mommy and Daddy cried for about ten minutes. Since I got no sleep last night I took a sizable nap this afternoon then got to work on dinner. 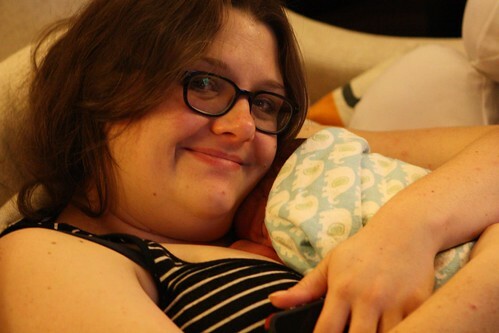 I started off by pouring Jen and her mum some rose and allowing them to snuggle and feed the babies. I got to work on this Exit 8 from Flying Fish Brewing Company. 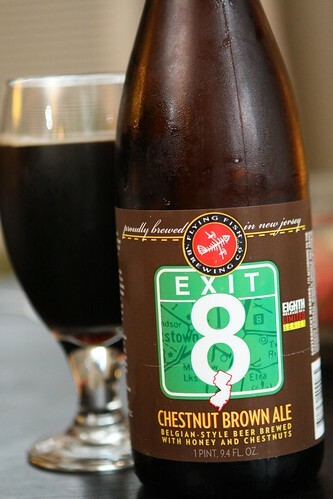 This is another in their series where they have a beer for every exit on the New Jersey Turnpike. I had their Exit 3 a little over three years ago. In that blog entry I talked about pacing myself and I think I did a pretty good job by waiting three years until trying another. It was a fantastic brown ale and I would highly recommend to any lovers of the style. I made another New Jersey themed dish with some New Jersey beefsteak tomatoes, Lioni mozzarella, basil, olive oil, salt, and pepper. 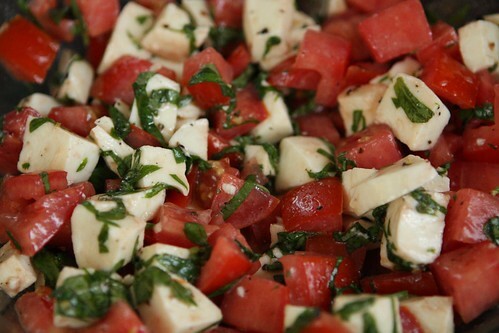 This is one of Jen's favorite summer salads. 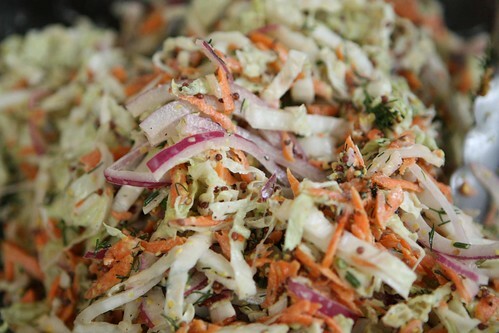 I also made a slaw with the Chinese cabbage from the farm along with red onion, farm dill, carrot, whole grain mustard, mayonnaise, hot sauce, and the remainder of the sauce from the zucchini fritters the other night. Jen told me that the reheated fritters with the sauce tasted like McDonald's hamburgers. She thought I would be offended but I was actually quite complimented. They wouldn't have sold so many if they weren't delicious. Also, she was absolutely right. 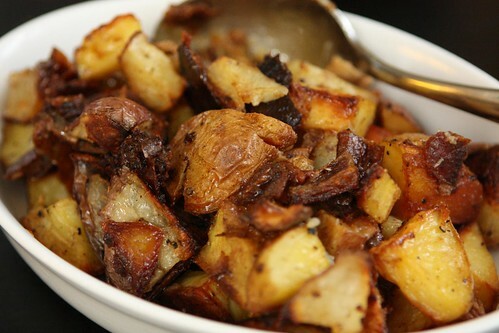 I roasted some potatoes in the oven then threw in a chicken after about 30 minutes above the potatoes on a wire rack to let the juices drip down and cook with the potatoes. 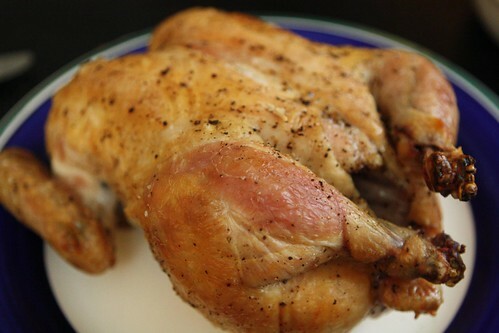 It was pretty tasty though nowhere near as delicious as that Cob Cob chicken we had for Passover. Unfortunately that ruined us on all other chicken for the rest of time. 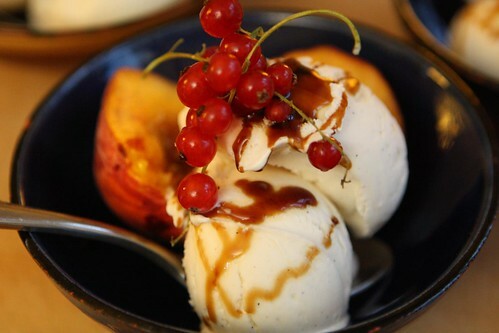 For dessert I chopped up some of the farm peaches and served them up with Longford's ice cream, farm currants, and balsamic glaze. After dinner we had a good round of wombat wrangling which involved snuggling, feeding, changing diapers that would shock you to your very core, and putting them down for bed. As I changed them I was reminded of the beginning of their day which they have long since forgotten but which still makes me cringe. It's like they put on the Peanuts Band Aid just to make it seem even more cruel and unusual. Not cool, Modern Pediatrics! Not cool!